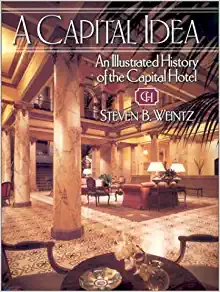 A Capital Idea: An Illustrated History of The Capital Hotel | SBW Ventures, Inc. The Capital Hotel is uniquely beautiful, with its cast-iron façade and marble lobby, its high-ceilinged rooms, and its rich history. Since its opening in 1876, it has been the stage for the struggles, schemes, and dreams of generations of politicians, debutantes, prostitutes, carpenters, and businessmen. And a wide variety of owners and visionaries has shaped the hotel’s fortunes, among them the Yankee entrepreneur who started it all; the Italian immigrant family who kept it going in its worst days; the architect who envisioned new lives for old buildings; and the financiers and craftsmen who brought the Capital to its current glory as a luxury hotel. The story of the Capital Hotel is also the story of Little Rock, and of many American cities: built in the commercial boom of the 1870s, in full flower at the turn of the century, battered by the Depression, optimistic in the postwar era, but decrepit by the late 1960s, then renovated in the 1980s and thriving today. This lavishly illustrated volume traces the history of the hotel from its origins as a commercial building to its spectacular renovation into a jewel of downtown Little Rock.